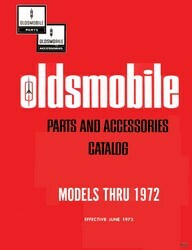 This is probably the most comprehensive edition of the Parts Catalogs for owners of '60s -'72 Oldsmobiles. Bear in mind that this does not necessarily include all OEM parts that came on the car, only ones that were still available from Oldsmobile to their dealers as of June 1972. Also it is possible that some of the parts listed are what were determined to be suitable replacement parts, not necessarily the same part that came on the car originally.